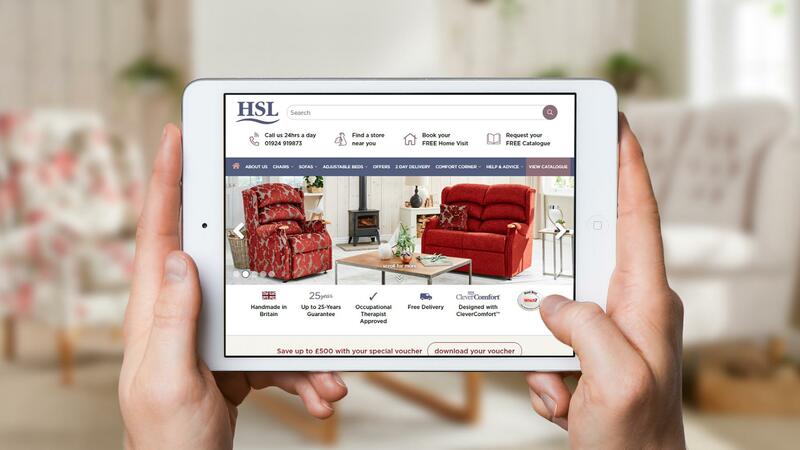 Fantastic have launched the new HSL Chairs web platform and will provide ongoing UX and CRO support to ensure continued customer engagement, improved experiences and conversions. HSL, which has 50 stores and 500 employees nationwide, approached us to develop a new non-transactional website that encourages customers to explore their extensive catalogue of products and drive footfall in store. “Understanding consumer behaviour both on and offline was key to developing the site and will guide the ongoing UX and CRO work,” said our Development Director, Chris Murphy. “80% of HSL’s customers are over 65 years of age and understanding them was fundamental. “Using a combination of audience profiling and user-experience software, we were able to incorporate the requirements into the design that would most benefit the user in assisting their purchasing journey. “We provide continual feedback on how users interact with the website, and how changes can be made to drive KPIs such as home visits and catalogue requests, providing continual reports and updates on a monthly basis,” he added. HSL Chairs has over 50 years’ experience in posture support. The family-run business brings together occupational therapy expertise, British craftsmanship and unique design principles, to ensure all its customers enjoy maximum comfort and style, in equal measure. Account Manager, Jo Barker, commented “Whilst non-transactional, it was critical that the new site design and functionality will effectively allow for prospective customers to discover HSL’s range of high-quality chairs & furniture. “In consideration of the website’s significance in relation to the user’s path to purchase, it was essential that the team at Fantastic worked closely with the team at HSL to deliver the site to high standards, meeting both client and customer requirements. “Following the successful launch of the site, we are excited to continue and build upon our digital support offering for the client”.